Redfin has an excellent feature called “Inventory and Housing Trends.” The data is city-specific and gives us a good idea of where home prices are heading. The data below is specifically for Arcadia, California and basically supports what we’ve been stating all along. 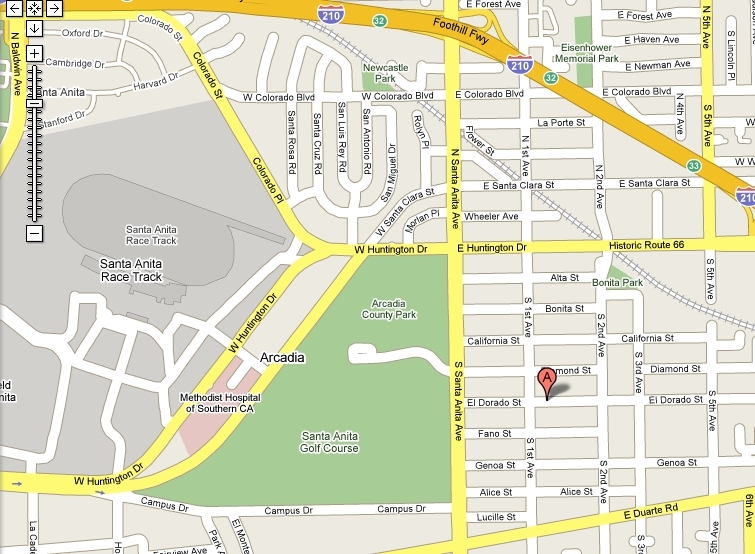 Arcadia home prices are under heavy pressure from increasing inventory, rising foreclosures and low-affordability. 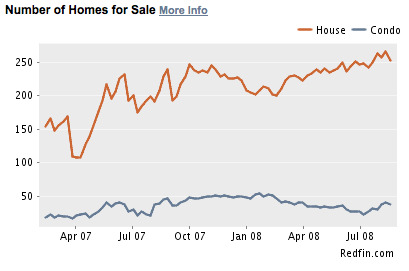 Inventory has essentially more than doubled since April of 2007. This is what happens when people are forced to sell their homes due to exploding ARMs, weak job market and just simply being underwater on their mortgage. 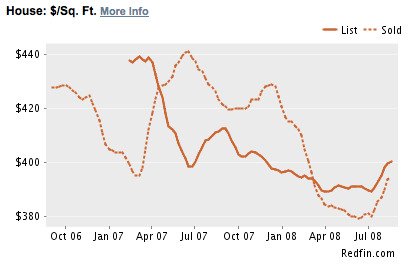 I suspect that we will break through the $350/sf mark for single family homes by the end of 2008. All those PUDs, condos and condo conversions will be hurting next year once the median is comfortably below $300/sf. 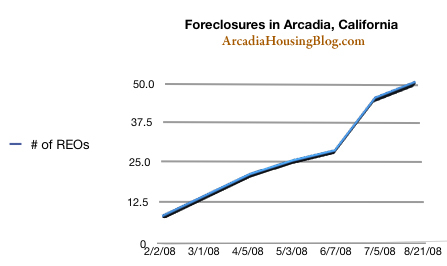 If these charts weren’t dismal enough, here’s my chart tracking the increasing number of Arcadia foreclosures over the last 6 months. 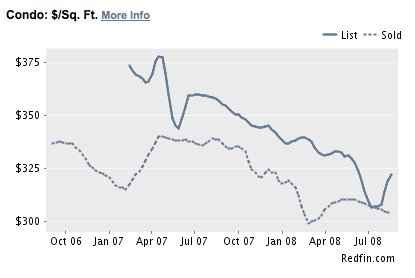 These are basically the first Arcadia-specific charts I’ve posted since arcadiahousingblog.com was launched. We have dozens of charts and graphs for Los Angeles county but historical city-specific data is always difficult to come by. Now that we have them, I hope all you readers will find the information useful! 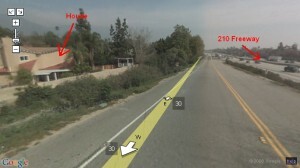 Lot Size: 10,220 Sq. Ft. So let’s knock another $100k off for upgrades and renovations. $800,000 is starting to sound like a great deal on this 3,265sf home ($245/sf). But… and there’s always a ‘but’ isn’t there? 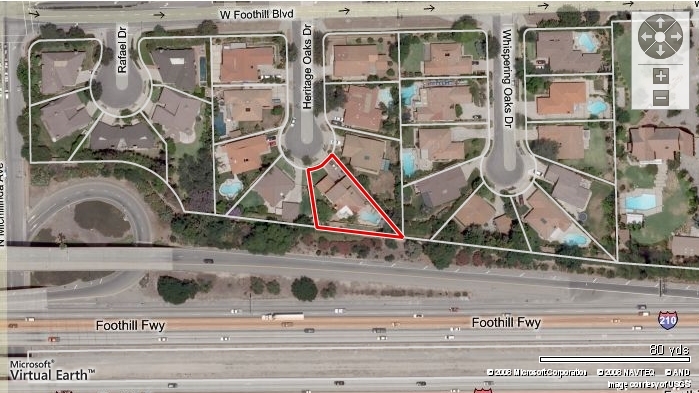 One look at the aerial map and I’d be surprised if anyone would even consider this home for $700k. What a great view of San Gabriel Valley’s finest freeway! Applying our standard appreciation table doesn’t help the evaluation of this property. I guess sitting next to the congested 210 freeway isn’t a highly desired amenity. Last purchased in 2000 for $489,000. Priced to Sell or Priced to Sit? OWNER PURCHASED THIS PROPERTY AT YEAR 2005 FOR $575,000 AND SPENT $20,000 TO UPGRADE KITCHEN COUNTER TOP, CABINETS, HARDWOOD/TILE FLOOR AND GARAGE FLOOR. THIS IS PRICED TO SELL. A neighboring PUD, newer and bigger, is currently listed at $404/sf and has been sitting unsold for 222 days. Will this seller suffer the same fate? $888k – Lucky enough to find a knife catcher? 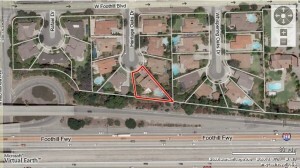 The following property is profiled by the request of one of our readers. It seems like many people are attracted to these PUD/townhomes. If you’re not into yard maintenance, driveways or require large lots to entertain with, then I suppose this is the perfect property for you! 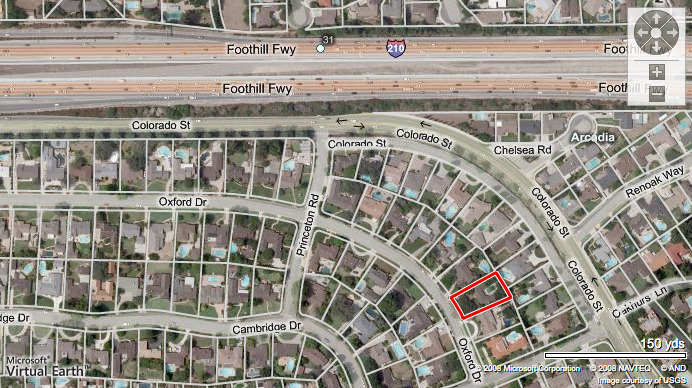 Lot Size: 10,408 Sq. Ft. I can’t argue about the location of this PUD. 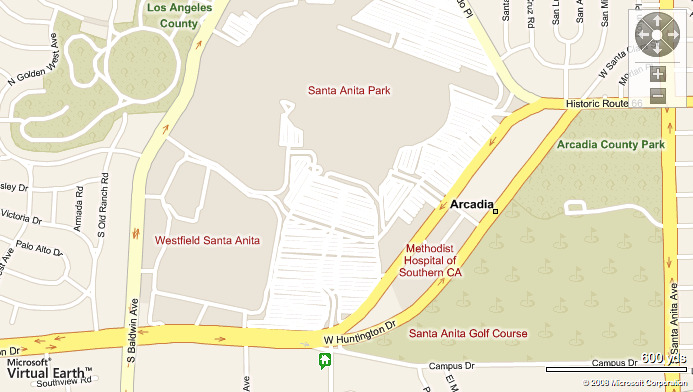 It’s a stone’s throw away from the golf course, Santa Anita Race Track, Arboretum and Westfield Shopping Mall. In fact, this is probably one of the closest properties to all 4 attractions! Exit, make a left and you’re on Huntington Dr. Can someone tell me whether this is a high traffic intersection? As far as valuation goes, my first comment would be that PUDs like this one used to go for ~$400k+ in early 2000. Although I know much has changed since then, it doesn’t change the fact that this class of property was built to be more affordable than single family homes and still generate a sizable profit for developers. Today’s valuation will be based on 2 properties located fairly close to this one or at least within proximity to all the same attractions. So just based on these 2 comps, $334/sf for today’s PUD is asking too much. 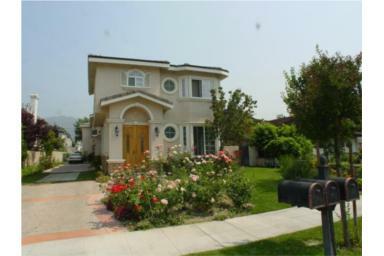 If this was a small detached home on a 7,000sf lot then maybe there would be a case for the $888,000 asking price. Stray a little farther West on Huntington Dr. and you will start to see PUDs currently listing for around $680,000 – $750,000. 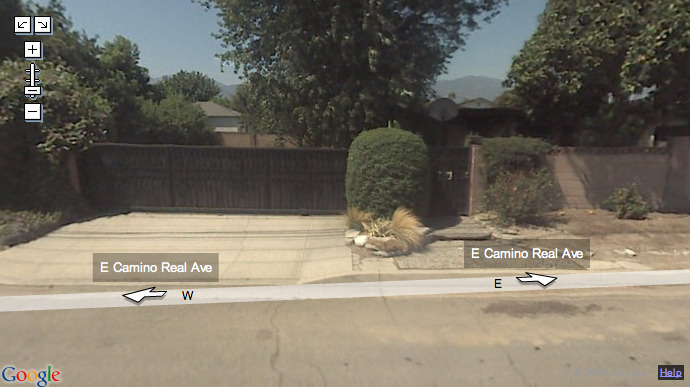 That is far below the today’s “lucky” $888,000 asking price. There’s not much to say about this property. 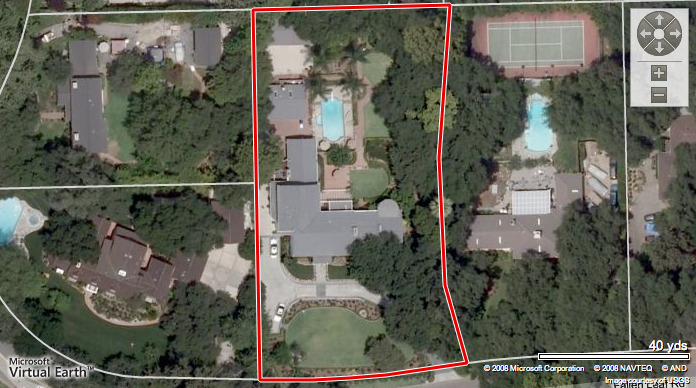 The home is big, the lot is huge and the price… just under $5,000,000. With 1 acre of land to work with, there’s no chance this home can be overbuilt like the hundreds of McMansions in Arcadia. That’s a $500,000 (9%) price reduction in 30 days. Even at this price point, the seller is not looking for a knife catch. Rather, he needs a filthy millionaire to come by who just has to live in Arcadia (for whatever reason). Purchased in 1996 for $1,750,000. If you’re wealthy enough to buy this home, will another $400-600k price drop concern you? 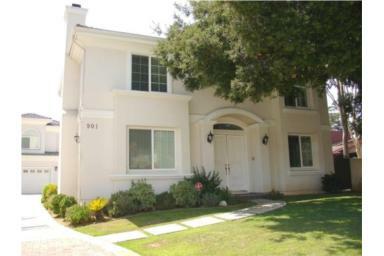 This is a new listing so no pictures have been posted yet. Fortunately, we won’t need photos to see how this story will unfold. 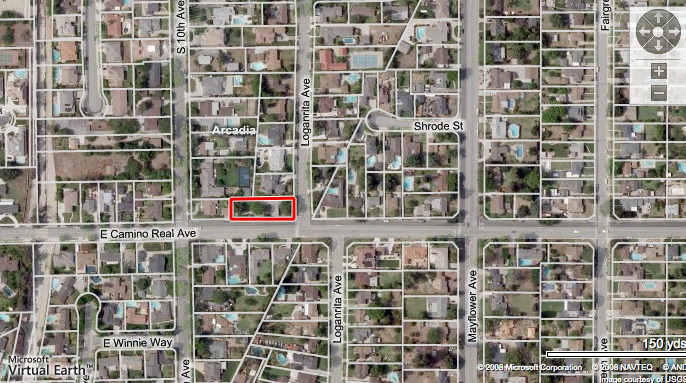 The property is East of 10th Ave. and borderline Monrovia. In fact, it is about 5 big blocks away from the gang shootings earlier this year. Although I love some parts of Monrovia, Old Town for instance, but the locals on this blog will know how rough some areas can get. 4 years later and the seller wants $700,000 for the same home. 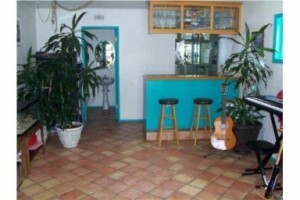 There is no mention of upgrades, remodeling or even proper landscaping. Maybe the fruit trees are worth a bundle? 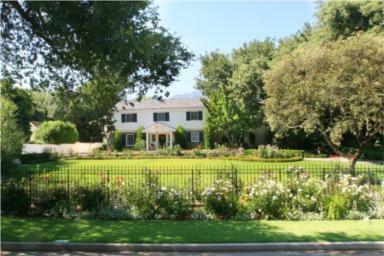 What the Owner Loves: The yard is incredible – 3 avocado trees, 3 orange trees, lemon, lime, grapefruit and apple trees. A great house for people with children and/or pets. A separate concrete patio with a grapevine trellis. Corner lot, plenty of space. Since appreciate is dead for a few years and real estate is, believe or not, depreciating, I’d peg this home at $300/sf – Giving us a value of $533,700. One last thing. 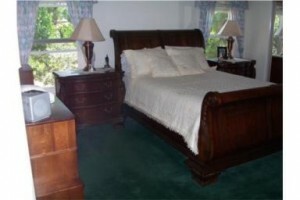 This is a FSBO listing so the seller probably knows $700,000 is just a wishing price. They will most likely find a knife catcher around $650k. Purchase this fixer-upper with 100% financing. Borrow more money for extensive remodeling and upgrades. But in the absence of double digit housing appreciation, this deal has horribly gone sour and now the owner is stuck with a $1,000,000 fixer-upper. What a shame too because this section of Peacock Village is very nice and beautiful. 2 BED 1 BATH 1 STORY HOME WITH LARGE FIREPLACE IN FAMILY ROOM. NEWLY PAINTED THROUGHOUT. SHOWS WELL BUT NEEDS SOME TLC. 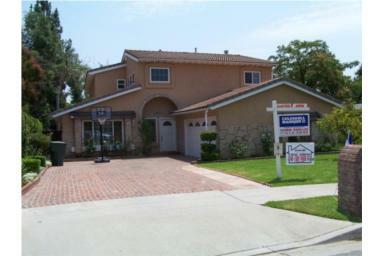 SHORT SALE SUBJECT TO LENDER APPROVAL. ALL OFFERS SHOULD BE ACCOMPANIED WITH PROOF OF FUNDS LETTER, PRE APPROVAL AND FICO SCORES. 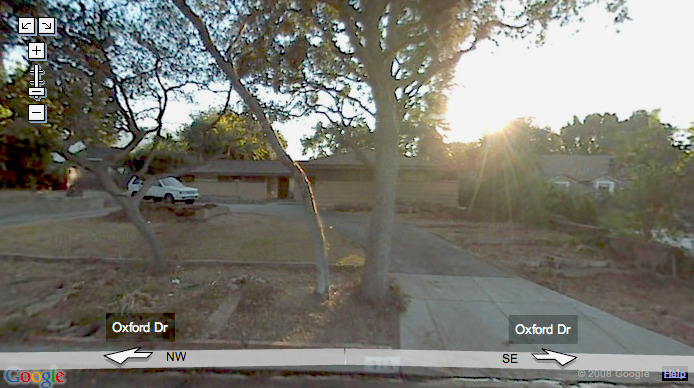 Take a look at the above photo… Would you spend nearly $1,000,000 for this home?